The FDA approval of amantadine, an oral, extended­release NMDA receptor antagonist, provides a new treatment option for dyskinesia in patients with Parkinson’s disease who receive levodopa-based therapy, with or without concomitant dopaminergic medications. 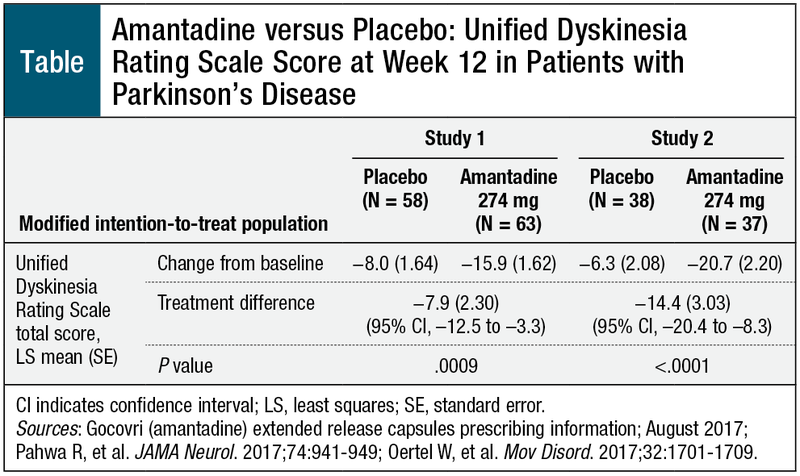 In 2 clinical studies, treatment with amantadine demonstrated a significant reduction in dyskinesia, a significant improvement in “on” time without troublesome dyskinesia, and a significant decrease in “off” time in patients with Parkinson’s disease with dyskinesia. 1. National Institutes of Health. Parkinson’s disease: new research offers hope for better diagnosis and treatments. NIH MedlinePlus. 2016;10:24. 2. National Institutes of Health. Parkinson’s disease. Fact sheet. https://report.nih.gov/NIHfactsheets/ViewFactSheet.aspx?csid=109. Accessed January 10, 2018. 3. Mayo Clinic staff. Parkinson’s disease. www.mayoclinic.org/diseases-conditions/parkinsons-disease/diagnosis-treatment/drc-20376062?p=1. Accessed January 10, 2018. 4. Ferreira JJ, Katzenschlager R, Bloem BR, et al. Summary of the recommendations of the EFNS/MDS-ES review on therapeutic management of Parkinson’s disease. Eur J Neurol. 2013;20:5-15. 5. Pahwa R, Tanner CM, Hauser RA, et al. ADS-5102 (amantadine) extended-release capsules for levodopa-induced dyskinesia in Parkinson disease (EASE LID Study): a randomized clinical trial. JAMA Neurol. 2017;74:941-949. 6. Oertel W, Eggert K, Pahwa R, et al. Randomized, placebo-controlled trial of ADS-5102 (amantadine) extended-release capsules for levodopa-induced dyskinesia in Parkinson’s disease (EASE LID 3). Mov Disord. 2017;32:1701-1709. 7. Adamas Pharmaceuticals. Adamas announces FDA approval of GOCOVRI as first and only medication for the treatment of dyskinesia in Parkinson’s disease patients. Press release. August 24, 2017. http://ir.adamaspharma.com/releasedetail.cfm?releaseid=1038209. Accessed January 9, 2018. 8. Gocovri (amantadine) extended release capsules [prescribing information]. Emeryville, CA: Adamas Pharmaceuticals; August 2017. 9. Adamas Pharmaceuticals. Adamas Pharmaceuticals receives orphan drug designation for ADS-5102 for the treatment of levodopa-induced dyskinesia associated with Parkinson’s disease. Press release. April 10, 2015. http://ir.adamaspharma.com/releasedetail.cfm?releaseid=905919. Accessed January 10, 2018. 10. Centers for Disease Control and Prevention. Influenza antiviral drug resistance: questions & answers. www.cdc.gov/flu/about/qa/antiviralresistance.htm. Accessed January 10, 2018.